People with right-sided heart failure develop symptoms because the right side of their hearts (the side that receives blood returning to the heart from the rest of the body, and pumps it out to the lungs) is unable to keep up with the work it is required to do. The inability of the heart to pump blood efficiently to the lungs causes the blood to back up into the venous system, and limits the cardiac output (the total volume of blood the heart can pump per minute). The symptoms produced by right-sided heart failure can be quite severe, and this condition can significantly reduce life expectancy if it cannot be adequately treated. Right-sided heart failure often occurs in conjunction with left-sided heart failure, so the general term “heart failure” typically encompasses at least some dysfunction of both sides of the heart. But on occasion, right-sided heart failure can occur by itself, while the function of the left side of the heart remains normal (or nearly normal). It is important to recognize right-sided heart failure, because its causes, the symptoms it produces, and the treatment it requires, are often different from the more typical, predominantly left-sided types of heart failure. Compared to the left side of the heart, the right heart is rather unimpressive. The job of the left ventricle is to pump blood out of the heart, against a relatively high pressure, to all the organs of the body. Doing this job efficiently requires the muscular walls of the left ventricle to be relatively thick and strong. In contrast, the right ventricle’s job is to pump “used,” oxygen-poor blood out to the lungs via the pulmonary artery, so it can be replenished with oxygen. Because the pulmonary artery is a low-pressure system, the right ventricle does not have to generate much of a blood pressure in order to do its work. For this reason, while the right ventricle must pump just as much blood with each heart beat as the left ventricle, the amount of work it must expend in doing so is only about 25 percent of the work the left ventricle has to perform. Because the right ventricle functions in a relatively low-pressure, low-work environment, it is a relatively thin-walled structure, with much less cardiac muscle than the left ventricle. 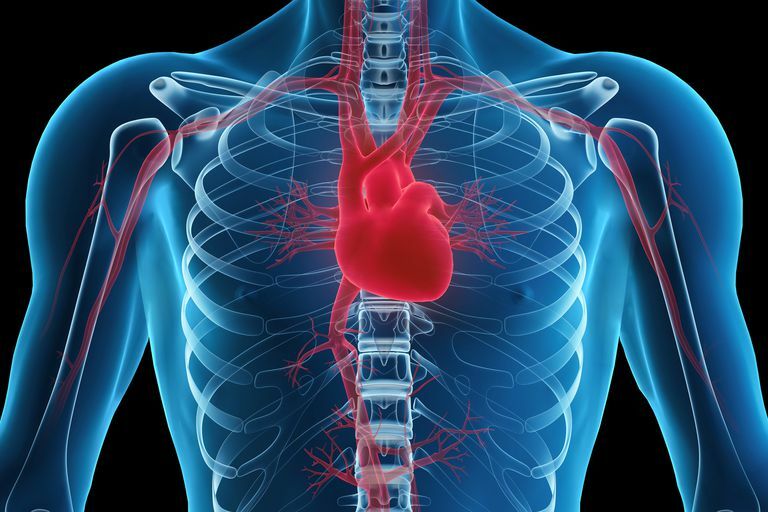 The right side of the heart is very efficient in pumping even large volumes of blood (such as during times when we are performing a lot of exercise). But the thin-walled right ventricle is much less effective in working under conditions of high pressure. So if the right ventricle finds itself having to work for extended periods of time against elevated pressures in the pulmonary artery, it begins to fail. Thus, right-sided heart failure usually occurs under conditions that cause elevated pressures in the pulmonary artery—that is, when pulmonary hypertension is present. When the right ventricle finds itself having to pump against a high pressure, it simply cannot work efficiently, and unless the elevated pressure is relieved, right-sided heart failure ensues. The list of conditions that cause predominantly right sided heart failure is different from the conditions that produce "classic,” predominantly left-sided heart failure. Because the left ventricle contains the lion’s share of the cardiac muscle, disease processes that affect the heart muscle tend to affect mainly the left ventricle. So, the heart failure that results from heart attacks, dilated cardiomyopathy, hypertrophic cardiomyopathy, and many kinds of valvular heart disease, is almost always predominantly left-sided heart failure. In contrast, the conditions that produce right-sided heart failure tend to fall into three general categories: conditions that produce pulmonary hypertension, certain types of valvular heart disease, and right ventricular heart attacks. Left-sided heart failure: Heart failure mainly affecting the left side of the heart (that is, “typical” heart failure), increases the pressure within the pulmonary vascular system, and this elevated pulmonary pressure often leads, eventually, to right-sided heart failure. In fact, it is correct to say that right-sided heart failure is a common and natural consequence of longstanding or poorly treated left-sided heart failure. Pulmonary embolus: A large pulmonary embolus can acutely elevate the pulmonary artery pressure to very high levels, and can thereby produce acute right heart failure. Smaller, recurrent pulmonary emboli can gradually increase pulmonary artery pressure, and thus may cause a more insidious onset of right heart failure. Chronic lung disease: Chronic forms of lung disease, especially chronic obstructive pulmonary disease (COPD) or obstructive sleep apnea, can eventually produce pulmonary hypertension and right heart failure. Acute respiratory distress syndrome (ARDS): This condition can produce an acute form of pulmonary hypertension and right heart failure. Congenital heart disease: Especially atrial septal defect and ventricular septal defect, this can eventually produce pulmonary hypertension and right heart failure. Other causes of pulmonary hypertension: This includes primary pulmonary hypertension, scleroderma, sarcoidosis, or various forms of vasculitis affecting the lungs. From this list, it is apparent that “pure” right-sided heart failure—that is, right-sided heart failure that is not caused by cardiac disease involving the left side of the heart—is almost always due to some form of lung disorder that produces pulmonary hypertension. Right-sided heart failure that is secondary to a pulmonary condition is called cor pulmonale. Because right-sided heart failure is so frequently caused by a lung condition, many doctors use “cor pulmonale” as a virtual synonym for right-sided heart failure. However, right-sided heart failure can have other causes as well, so in fact these terms are not actual synonyms. Any type of valvular heart disease whose chief effect is to increase the pressure within the right side of the heart, or to obstruct the flow of blood through the right side of the heart, can produce right-sided heart failure. While disease of the right-sided heart valves—the tricuspid valve and the pulmonary valve—can cause right-sided heart failure, this turns out to be an uncommon cause. Regurgitation (leaking) of these two valves is usually the result (and not the cause) of pulmonary hypertension. Stenosis (narrowing) of these valves is usually caused by congenital or rheumatic heart disease that affects other parts of the heart to a greater extent. So either tricuspid or pulmonary valve disease, by itself, is an extremely infrequent cause of right-sided heart failure. On the other hand, stenosis of the mitral valve—the valve that lies between the left atrium and left ventricle—commonly causes right-sided heart failure. Blood returning to the left atrium from the lungs tends to “dam up” when mitral stenosis is present, leading to increased vascular pressures in the lungs, which eventually produces pulmonary hypertension and right-sided heart failure. People who have myocardial infarctions (heart attacks) caused by a blockage in the right coronary artery may suffer from damage to the right ventricular muscle, producing right-sided heart failure. Treating a right ventricular heart attack is generally similar to treating any STEMI, including rapidly opening up the blocked blood vessel with “clot-busting” drugs or a stent. However, because right-sided heart failure can limit the amount of blood that reaches the left side of the heart, drugs aimed mainly at treating left-sided ventricular weakness (such as nitrates, beta blockers, and calcium channel blockers) need to be used with great caution in people having right ventricular heart attacks. The symptoms caused by right-sided heart failure can be very similar to the symptoms experienced by people with “typical,” predominantly left-sided heart failure. These include dyspnea (shortness of breath), weakness, easy fatiguability, and edema (swelling). With right-sided heart failure, however, some of these symptoms can be particularly severe. Dyspnea on very trivial exertion, extreme fatigue, and even lethargy can occur. The edema experienced by people with right-sided heart failure is often far worse than “merely” edema of the ankles and lower extremities. They can have edema of the thighs, abdomen, and even the chest. Also, right-sided heart failure can cause the liver to become swollen and painful, and can lead to severe ascites (fluid accumulation in the abdominal cavity). Anorexia (significant loss of appetite) can become a prominent symptom. People with right-sided heart failure can also have exertional syncope (loss of consciousness), because they cannot increase their cardiac output when they exercise. A careful clinical examination should provide doctors with a strong clue as to the presence of right-sided heart failure. The character and quality of symptoms (just described) are very important in making the diagnosis, as is any medical history of pulmonary problems, deep venous thrombosis or pulmonary embolus. Electrocardiogram (ECG) and echocardiogram studies often reveal elevated pulmonary artery pressure, and may show valvular heart disease or disease affecting the cardiac muscle. These tests usually clinch the diagnosis of right-sided heart failure. Additional testing is usually necessary to help pin down the cause of the right-sided heart failure. For instance, pulmonary function testing can confirm the presence and severity of COPD, and sleep testing can help make the diagnosis of sleep apnea. CT scans, MRI scans, and/or cardiac catheterization may also be needed, depending on which type of underlying cause is suspected. It is critical to pin down the underlying cause, because treatment depends upon it. If the cause is valvular heart disease (most typically, mitral stenosis), surgical repair or replacement of the diseased valve is necessary. When a right ventricular myocardial infarction is the cause, aggressive and rapid treatment to open the blocked right coronary artery is needed. If the underlying cause is left-sided heart failure, adequate therapy of the right side of the heart requires optimizing treatment for the left-sided heart failure. When the cause of right-sided heart failure is a pulmonary disorder (that is, if cor pulmonale is present), then the treatment relies on optimizing the treatment of the underlying lung problem. While the underlying disease process is being identified, and treatment for it optimized, diuretics may be used to relieve excessive edema (although these drugs need to be used judiciously in right heart failure). Care must be taken to avoid conditions that further increase the pulmonary artery pressure, such as low blood oxygen levels, and acidosis. Drugs that can reduce pulmonary artery pressure may also be useful. But the bottom line, again, is that really treating right-sided heart failure means aggressively treating the underlying cause. Right-sided heart failure is a very serious condition that usually causes severe symptoms, and can cause premature death. It is critical that anyone with this condition receive a thorough medical evaluation to clearly identify the underlying cause, and then receive aggressive treatment to reverse or ameliorate that underlying cause. Bruce CJ, Connolly HM. Right-Sided Valve Disease Deserves a Little More Respect. Circulation. 2009; 119:2726. Harjola VP, Mebazaa A, Čelutkienė J, et al. Contemporary Management Of Acute Right Ventricular Failure: A Statement From the Heart Failure Association and the Working Group on Pulmonary Circulation and Right Ventricular Function of the European Society of Cardiology. Eur J Heart Fail 2016; 18:226. Dutta T, Aronow WS. Echocardiographic Evaluation Of The Right Ventricle: Clinical Implications. Clin Cardiol 2017; 40:542.